If you'd like a chance to win a cool prize and donate to an important cause, just by commenting, check out this post at MiG Writers. One of my critique buddies, Carmella Van Vleet, has a daughter with a growth disorder (read her story here). And today is an unofficial "Growth Disorder Awareness" Day for the MAGIC Foundation, a non-profit organization that helps families who have children with rare conditions and diseases that affect growth. Over at MiG Writers, we're supporting this event with a giveaway and fundraiser. For every person that comments, Carmella is donating $1 (up to $60, her daughter's current height in inches), PLUS everyone that comments has a chance to win one of 6 great prizes! For details, visit the MiG Writers. Sometimes it's hard to stay motivated. For me, this most often happens after I've sent out some queries and I'm trying to stop thinking about them by working on a new project. The "not for me" responses start trickling in and the beginning excitement of the new project wears off when I actually have to work at it. Then I start looking for ways to avoid writing, like blogging or cleaning my desk (a sign that I'm really in trouble). Does this happen to you? 1. Take a writing workshop. Getting an expert's view of the process often inspires me to get working on my writing. Somehow, I see my writing differently after getting another perspective. 2. Talk with a writing group. So much of my inspiration comes from my family and my writing buddies. Lately, my writing buddies and I have been checking in with updates on our writing progress. Knowing that they are working hard on their writing inspires me to work hard too. 3. Set a simple goal. I'm not talking about something like "Finish novel by end of the month". I try to set goals that I feel like I might actually accomplish, especially if I'm trying to build up some writing momentum. If I start small, and then actually meet my goal, it inspires me to reach higher next time. 4. Read (or listen) about writing craft. When my writing is stalled, sometimes I pick up a writing craft book, seek out some writing blogs or tune into a writing podcast for a little inspiration. I don't like to read books in my genre or visit bookstores when I'm lacking motivation, because it just reminds me of what I'm not accomplishing. How do you stay motivated to work on your writing? If you're stuck for an idea, check out this post by my MiG Writers group about where we get our best ideas. 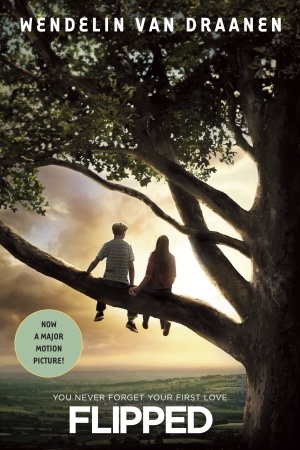 Marvelous Middle Grade Monday: Flipped! Julianna Baker begins crushing on Bryce Loski from the first time they meet, in grade 2, and is convinced for years that he will be her first kiss. The problem is, Bryce doesn’t see it that way. He finds Juli annoying. As the two of them grow up through middle school, the author shows their two different and sometimes humorous points of view about a destroyed sycamore tree, Juli's homegrown chickens and their eggs, and a variety of family problems. By the end of the book, their feelings are flipped: Bryce really likes Juli and Juli has gotten over her crush. This is definitely a book to show you how to write different points of view. I loved the way the author took the same story event and showed it through the eyes of the two different characters, emphasizing what each character would notice. I also loved the layers the author created in this story, by going beyond the surface to include family issues, while still keeping the story firmly from a middle grader’s point of view. Although I’ve seen this novel referred to as “teen” or “YA”, to me, it definitely has a middle grade feel. This book is a stand alone. It has been made into a movie, Flipped, 2010, directed by Rob Reiner. For more info, visit Wendelin Van Draanen’s website. Yay! Got through another work week. Is it just me, or has September been flying by? I feel like I haven't had much time to really get into my writing. Instead, I've been snatching a few minutes here and there. But something is better than nothing! In the past couple of weeks I discovered this gem on voice. If you haven't seen this post at Notes from the Slushpile, I highly recommend it: Finding your voice: A masterclass from SCBWI with Beverley Birch by Addy Farmer. For other resources on voice, check out my V is for Voice post featured in the ABCs of writing middle grade fiction (see my sidebar). On the advice of some of my critique buddies, I've cut out one of the characters in my latest project. I know it's for the best (she didn't make a strong contribution to the plot). It also meant I had to cut out some funny lines, but I'll get over it. Have you ever had to cut a character? Does it give you a strange sense of satistfaction (like being a puppet master where they are all in your control) or does it make you sad? Sometimes I catch myself doing too much thinking about my writing. Of course I need to think about the character's goals, obstacles and what needs to happen to help the plot hang together. But sometimes I can get hung up on these things instead of actually writing. It reminds me of how I can park my van perfectly if I pull into the spot and don't think much about it, but if I pause and wonder if I'm coming in at the right angle, I start having doubts. Sometimes I even end up driving right past a perfectly good spot because I thought too much about the mechanics of the process. Does this ever happen to you? I get fixated on how a scene will fit into the overall storyline, instead of just writing it and deciding that later. Not everything needs to be worked out. For me, a lot of the good stuff emerges while I'm writing. Since I read so many middle grade books (see my 100 book challenge) and I blog about writing middle grade books, I thought I’d join in on Marvelous Middle Grade Monday (aka MMGM) from a writer's perspective. The more I read MG, the more great books I’m finding. And some of them come from other bloggers doing MMGM (for example, see Shannon Whitney Messenger's blog). Set in 1968, this novel tells the story of eleven-year-old Delphine and her two younger sisters, Vonetta and Fern, who fly across the country to spend the summer with the mother who abandoned them seven years ago. Their mother is busy working on her poetry and doesn’t want them there. She sends them to a summer camp, sponsored by revolutionary Black Panthers, and leaves Delphine to care for her younger sisters. This is a great book to read for learning about how to create character—if you can stop from losing yourself in the story long enough to think about the writing. One of the wonderful things about this novel is the way the author has used details and shown the time period and setting from an eleven-year-old perspective. The opening intrigued me, since I haven’t read another middle grade novel that starts with a plane ride. I loved what the author said in her acknowledgements, “I wanted to write this story for those children who witnessed and were part of necessary change.” It made me think about what I want to say in my own writing. This book is a stand alone. It is a 2011 Newberry Honor Book, and has won several other awards, including the 2011 Coretta Scott King award. For more, visit Rita Garcia-Williams’ website. This week I read several blogs that got me thinking about my approach to exercise (I don't) and how to incorporate more fitness into my already packed day. If it comes to a choice between using my time for writing or taking a walk, writing usually wins. But since it's September and I'm working on my new fall goals, I've included getting more exercise. My philosophy is that ANY amount of exercise is better than none. I don't plan on running marathons or anything. Although even I have to admit that playing Wii Fit is pretty feeble. (Hey, there are fitness benefits. 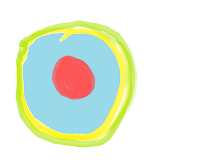 I read a study.) And much as I'd like to point out that climbing stairs while carrying a full load of laundry is working my muscles, it's more part of ordinary activity than fitness. What I have figured out is that I can connect exercise to writing. When I go for a walk (all the sane members of my family are watching TV), I bring along my ipod and listen to a favourite writerly podcast. I like Wordplay podcasts (James Dashner, Nathan Bransford and J Scott Savage) and The Creative Penn with Joanna Penn. What do you do to stay fit? Any good podcast recommendations? I don't usually post on Thursdays, but I heard today was International Dot Day and I couldn't resist. 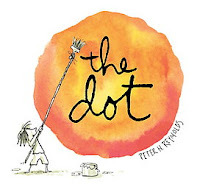 The Dot by Peter Reynolds is one of my favourite picture books. For more about this book, check out Peter Reynold's website. Do you have any creative dot ideas? Hmm...cupcakes with dots on them would be good, too. When I think of quirky, I think of something you wouldn't find just anywhere. Something that's a little bit different, and special because it's different. It's a book with things you wouldn't normally think of together (but a middle grader might). Quirky fits well with writing middle grade, because 9 to 12-year-olds are at an interesting place in their lives. They sometimes play like younger kids, creating intense imaginary worlds, but a few minutes later, they might be texting friends like a teenager. They can act all sophisticated by choosing the perfect school outfit and then come home and work on capturing more crickets for their collection. For me, quirkiness is one of the reason why I enjoy reading (and writing) books for middle grade readers. What do you think "quirky" means? How can you capture "quirky" in your writing? Since I read so many middle grade books (see my 100 book challenge) and I blog about writing middle grade books, I thought that from time to time I’d join in on Marvelous Middle Grade Monday (aka MMGM), from a writer's perspective. The more I read MG, the more great books I’m finding. Some of them are courtesy of other bloggers doing MMGM. Summary: Rory has been waiting to turn 12 forever. Whenever she wanted something, like getting her ears pierced or getting a cell phone, her parents told her to wait until she was 12. So she’s kept a list of everything, big and small, that she wants to do. When her birthday finally comes, she starts work on getting the things she’s wanted – with funny and surprising results. My take: If you want to write MG for girls, I definitely recommend reading this book. It taps into what 10- to 12-year-old girls are thinking about. Even though it’s got typical “girly” stuff like makeup, worrying about boys, and boy-girl parties (there’s even a couple of movie stars), Rory feels like a real kid with real parents (who are part of the story). I loved the humour and the voice in the book. Rory's story brought back many memories of what life was like for me at that age. I read through the book in one afternoon, and immediately passed it on to my daughter, who recently turned twelve. Other info: This book is part of a series, which includes: 13 Gifts and 11 Birthdays. You don’t need to read the other books to understand this one, but if they are anything like Finally 12 I think they’d be worth a read. I'm going to look for them! For more, visit Wendy Mass’s website and blog. Yay, Friday! This first week back to school has been exhausting. But it feels good to get back into a routine. Every fall, there are new classes, new schedules, new things to shop for -- so much new it can feel overwhelming. Since Wednesday, my goal for the week has been to actually use the writing time I blocked out for WRITING. Three days isn't much but I did it. Getting back to writing feels comfortable and familiar, and it counteracts some of the beginning-of-the-school-year chaos. It's definitely something to feel good about. Oh yeah, and I also treated myself to some expensive cheese and a new turquoise purse (my inner celebration of getting back on track). What did you feel good about this week? Did you have any writing goals? Why is Writing So Slow? It struck me yesterday that the perspective-taking I do as a writer isn't so different from what I do as a teacher, especially at the beginning of the year. I think about the school day from a student perspective and the details a student needs to know to succeed (from "Where is the bathroom?" to "What should I do after I finish my work?") Then I decide which ones I need to explain or show them first and which I can leave for later. The difference is that as a teacher, I need to explain or show pretty much everything. As a writer, I have to be more picky. My explanations need to be more artful and less explicit. Once I'm inside the the perspective of a character, I need to extract the essential and the unique and somehow capture that on the page. That's what takes me a long time. What slows you down about the writing process? Even though I was blogging while on vacation, I didn’t write much about what I was doing. Since Friday is kind of my “anything goes” day here on the blog, I’ll tell you about two awesome things. Awesome thing #1: The Wizarding World of Harry Potter. Yes, it’s crowded. Yes, there are line ups. But it really shows how attention to detail can help to bring the world of a novel to life. Even though we were overheated and surrounded by mobs of other tourists, the magic was still there. From the Butterbeer (okay, it’s $3 a cup but you have to try it) to the screaming mandrakes in the shop windows to Dumbledore’s office inside the Hogwart’s castle ride, it was amazing to soak it all in, especially when you’re there with two kids who have memorized so many of the details in the novels. It really was huge for them (even though it half of it was basically gift shops cleverly disguised as shops in Hogsmeade), so we ended up buying them their own wands. I met one of my critique buddies in person! Up until 2 weeks ago, I’d never met any of the other MiG Writers in person, even though we’ve known each other for years. We formed our group online and we live in many different places. It was so exciting to meet Christina Farley face to face! Since we knew about each other’s writing projects, we could talk about them without a lot of explanation. It was fun to fill in some of the bits and pieces about each other’s backgrounds that we didn’t know, chat about ordinary stuff, our writing, and of course Christy’s big news about getting an agent (if you haven’t seen her blog, check it out). The time went by too fast!!! Have you ever gotten to know someone online and then met them in person?